Young people in Broxtowe, along with their parents and carers are being encouraged to make Halloween safe and enjoyable this year, as part of Broxtowe’s ‘No Trick or Treat’ campaign. 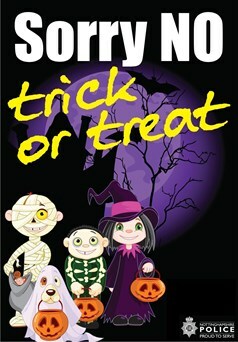 As part of the campaign, Broxtowe Borough Council and Nottinghamshire Police are urging local people to help put a stop to the anti-social behaviour that is often associated with Halloween by not visiting houses displaying ‘No Trick or Treat’ cards. ‘No Trick or Treat’ door and window cards will be available for free from various locations in the borough, including the Council Offices in Beeston, libraries and police stations, as well as being available to download from the Council’s website at the Halloween safety page. Do not throw items like eggs and flour – this is not a trick and can be classed as criminal damage or even assault. For more information, please contact the details provided below.